The regular season is complete and the brackets are set. Let’s check out the Kpreps Rankings to see how things stand as we begin elimination games this week. Top-ranked Derby won the battle with unbeaten Maize, 35-21. The Panthers got three rushing touchdowns from Hunter Igo and two more from Tre Washington to hold off the Eagles and earn the top seed on the west side of Class 6A. Lawrence Free State got a strong test from crosstown rival Lawrence, but the Firebirds scored twice in the fourth quarter to win 28-13. Keenan Garber returned an interception for a touchdown and caught a touchdown pass to pace the Firebirds. Gardner-Edgerton stays in the No. 3 spot after beating Shawnee Mission West, 35-14. Jacob Hunsperger rushed for three touchdowns and Luke Jennings added two more as all five Blazer scores came on the ground. Topeka High played without standout back Ky Thomas, but had little trouble in rolling past Topeka West. The Trojans scored all 56 points in the first half in improving to 7-1. Finally, Shawnee Mission East secured the No. 2 seed on the east side of Class 6A with a 38-7 win over Olathe West on Thursday night. St. Thomas Aquinas remains in the top spot this week, but the Saints did not play. Aquinas will open the Class 5A bracket by hosting Topeka Highland Park, a team that has lost 42 consecutive games. Wichita Northwest stays in the No. 2 spot after a 61-12 win over Wichita Southeast. The Grizzlies open the 5A bracket by hosting Salina South (1-7). The Cougars picked up their first win of the season by beating Newton last week. Maize stays in the No. 3 spot despite the Eagles loss to Class 6A No. 1 Derby. Maize slipped to the No. 2 seed on the west side of 6A and will host Liberal. Defending Class 5A champion Bishop Carroll remains in the No. 4 spot this week after blasting Wichita South, 52-6, and Mill Valley stays in the No. 5 spot after a blowout win over Blue Valley Southwest. Both the Eagles and Jaguars earned the No. 4 seeds on their respective sides of the Class 5A bracket. Bishop Miege scored 48 points in the first half in rolling past Blue Valley Northwest, 55-14. Sam Pedrotti threw four touchdown passes and rushed for a fifth score in the first half of Friday’s game. Miege will open bracket play against Labette County – a team the Stags defeated 69-23 in the second round last season. Another week, another blowout win for McPherson against AVCTL competition. This time, the Bullpups blasted Towanda-Circle, 56-12, by scoring all 56 points in the first half. Kyler Hoppes threw four touchdown passes – three to Gabe Hoover. Pittsburg moves up one spot this week to No. 3 after outscoring De Soto, 49-35. Dylan White caught two touchdown passes and returned a punt for another score, all in the first quarter. The Purple Dragons led 35-28 at halftime, and widened that lead to 49-28 in the second half. Louisburg moves up one spot to No. 4 after the Wildcats went on the road and dominated No. 5 Paola, 25-7. The Wildcats won the Frontier League championship with the victory and earned the No. 1 seed on the east side of Class 4A. Paola, drops two spots to No. 5 in this week’s poll. The Panthers couldn’t overcome four turnovers in the game. Andale finished off their District 6 championship with a 35-13 win over Cheney. It was the Indians closest game since a 42-14 win over Mulvane in the season-opener. Second-ranked Sabetha won its 15th straight game by rolling over Royal Valley, 48-0. Gabe Garber passed for 125 yards and three touchdowns, while Joe Gruber led the ground game with 123 yards and a touchdown. Scott City made the long road trip to Concordia and came away with a 43-20 win. Wyatt Hayes rushed for 217 yards and two touchdowns to lead the Beavers. Pratt rolled to another Central Kansas League victory by beating Nickerson, 49-14. Travis Theis rushed for 122 yards and two touchdowns and also passed for a score. 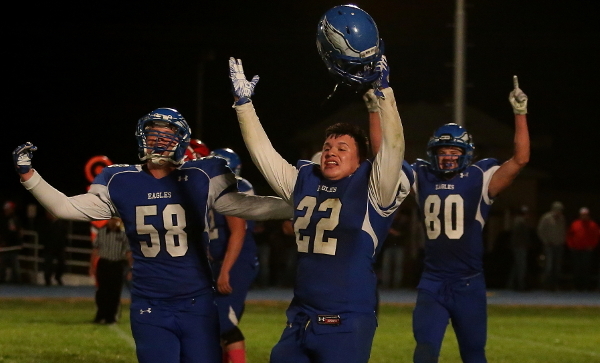 Finally, fifth-ranked Galena rolled to a district title with a 52-14 win at Parsons. The Bulldogs controlled the game early by answering Parsons’ first score with a JC Shelton kickoff return for a touchdown. Galena led Parsons 32-8 at halftime. Phillipsburg remains in the top spot in Class 2A with a dominating 61-1 win over Minneapolis. The unbeaten Panthers will host Southwestern Heights to open this week’s bracket play. Silver Lake is again No. 2, but didn’t play last week due to a forfeit by Oskaloosa. The Eagles won another district title and will host Riverton this week. Conway Springs won its annual battle with Central Plains League rival Garden Plain, 28-7. Collin Koester rushed for 147 yards and three touchdowns to lead the Cardinals. Conway Springs jumped out to a 21-0 lead at halftime to remain unbeaten. The biggest game in the classification last week occurred in Hutchinson where No. 4 Trinity Catholic scored on a 30-yard touchdown pass from Kaleb Hammeke to Isaac Miller with a minute remaining to beat then No. 5 Chaparral, 26-22. As a result of the loss, Chaparral drops out of this week’s poll to make room for the Humboldt Cubs to enter in the No. 5 spot. Humboldt put the finishing touches on a dominating regular season with a 54-12 win over Southeast-Cherokee. The Cubs have outscored their opponents 461 to 44 this season. Top-ranked Smith Center got a big scare but survived Ell-Saline with a late score. Smith Center trailed 8-7 for much of the fourth quarter until Hesston Maxwell scored from 1-yard out with 25 seconds remaining to give the Redmen an 15-8 victory and the district championship. Olpe also claimed a district title by beating Hillsboro, 28-6. Kynden Robert and Blaine Hinrichs combined for 260 rushing yards as the Eagles handed the Trojans their second loss this season. Elkhart had an open week given the Wildcats three-team district. Elkhart completed its regular season with a big win over Stanton County in Week 7. The Wildcats will host winless Sublette this week, which Elkhart defeated 68-28 back in Week 3. Centralia rolled to a sixth straight win and wrapped up the Twin Valley League 11-man championship by beating Valley Heights, 49-22. Centralia’s Kamble Haverkamp rushed for 140 yards and three touchdowns in the win. Finally, Jackson Heights remains in the No. 5 spot this week after 47-8 win over Lyndon. Cooper Williams led the Cobras with 302 rushing yards and six touchdowns on the night. Central Plains cruised to a sixth consecutive shutout by topping Macksville, 46-0. The Oilers have allowed only 22 points all season and haven’t allowed a single point since Week 2. There is some change in the middle of the poll as Hodgeman County was upset at Ness City, 28-26. The Eagles scored in the fourth quarter to take the two-point lead, and stopped Hodgeman County on fourth-and-1 inside the 5-yard line with less than a minute to go. As a result, Hodgeman County falls two spots to No. 4 this week, right ahead of No. 5 South Central who the Longhorns beat 28-14 back in Week 2. Clifton-Clyde moves up a spot this week to No. 2 after shutting out Lincoln, 46-0, and St. Francis had no trouble with rival Atwood-Rawlins County, 58-8, to win the annual Yoke Bowl. South Central remains in the fifth spot after beating Argonia-Attica, 38-22. Once again this is no change in the Division II poll as all five teams won by at least 46 points. Top-ranked Hanover had little trouble with 1-loss Frankfort, besting the Wildcats 46-0 at halftime. Axtell stays at the No. 2 spot after a 74-28 win over Doniphan West. Senior wide receiver Hunter Koch had four touchdown receptions in the game to tie the state record for career touchdown receptions with 57. The old record was set by Central Plains’ Layne Bieberle from 2012 through 2014. Third-ranked Osborne got five total touchdowns from quarterback Darnell Holloway in a 58-12 win over Thunder Ridge. Finally, No. 4 South Barber remained unbeaten (7-0-1) with a 58-0 halftime win over Pretty Prairie, while No. 5 Otis-Bison’s record improved to 6-1-1 after beating Ingalls, 56-6.